Hey you! Have you met Amelia, my new sis from Australia? I adore her! She's all about that cultural, creative, and culinary arts life with her blog - The Beat of Adventure. Her conversational prose provides vividly infectious insights on her travels abroad to New Zealand and Japan while blessing you with humorous inspiration to see more of the world. As a printer & graphic designer by profession, she believes the passion that travel evokes is a powerful motivator for all things creative. A lover of Lauren Hill, J. K. Rowling, and Tokyo Disney, allow her to be your Aussie muse for exploring new destinations and reconnecting with your inner child. Read for yourself and thank me later! I remember it vividly. The day I realised I’d have to plan a solo trip to Europe. It’s up there with our penchant for smashed avo on toast (that’s avocado, for all the non-Aussies in the house) and taking pics of our food guilty as charged for the ‘gram. Gondola ride in Venice - that hat takes me back! The one thing more common, and less talked about is the inevitable moment our friends bail on what was supposed to be a shared adventure. I’m not alone in deciding to go solo only after being told, ‘I can’t get time off work’ or ‘I’m broke af’ (usually that last one, am I right?). And thus began my journey of travelling alone for the first time. So put on your pjs, pour yourself a drink, and settle in for a bit as your Friendly Neighbourhood Aussie gives you the 4-1-1 on why you absolutely MUST try it! 1. Travelling alone for the first time doesn’t mean being lonely. Besides a few weeks exploring London and visiting family, my sojourn (okay, trip) to Europe was spent on a Topdeck Tour. Yep, the bus loads of 18 to 30-somethings that you’ve seen? That was me. And I loved every minute… except for that hostel with the bedbugs (those minutes sucked). But otherwise, I was #blessed to have an amazing group. I made a friend within minutes of getting to the meeting spot on the first day, and plenty more followed after that. I’m still in contact with a lot of them 6 years later and even visited one in their home country of Maple Syrup Canada. Over the years, I’ve learnt that solo travel is scariest to people who worry about not making friends. Pont du Gard Roman aqueduct near the town of Vers-Pont-du-Gard in Southern France. If you’re apprehensive about travelling alone for the first time, remember there are options all over the world. From larger group tours like Topdeck and Contiki. To smaller ones like Intrepid and G Adventures. 2. You can experience new places your own way. Let me get touristy for a moment. I went to the Harry Potter Studio Tour in London on my first solo trip, after my Topdeck tour. I’m a massive Harry Potter nerd fan and ended up spending nearly a full day there (I’m sure J.K. Rowling would be impressed, if not slightly concerned). Now admittedly that’s excessive, even for me. I took in every prop, every set, every glorious detail. With no one waiting for me or urging me to hurry the hell up. The enormous chess pieces from Harry Potter and the Philosopher’s Stone, at the entrance of Warner Bros. Studio Tour London. Travelling with friends is a make or break experience no matter how well you get on normally. Tensions can flair quicker than a toupee in a cyclone! Experience new places and cultures in your own way. Eat as crazily or traditionally as you want. Are you more frog legs, or bangers and mash? The choice is yours. Be on your own schedule. Perfect for the planning obsessive or loosey-goosey explorer. Though these things seem small, they make a huge difference to the overall quality of your trip. 3. You adapt more quickly. Bear Grylls has nothing on a solo traveller! Throw us in the deep-end and we’ll find a way to swim. Which is completely ironic ‘cause your girl can’t actually swim, I’m a failure of an Aussie, LOL! Swiss flag on Jungfraujoch, the ‘Top of Europe.’ The highest railway station in Europe (3454m above sea level). Swimming aside, I’ve managed situations that didn’t phase me when abroad on my own. But the same situations might have stressed the hell out of me if I was back home, or travelling with friends/family. My first time travelling alone, I walked around London and took the tube late at night with all the confidence and awareness of a local. Not recommended if it can be avoided, but given the situation, I adapted. Miss your train, or book the wrong hostel? You’ll learn quickly to manage. Getting lost becomes an opportunity to connect with locals. Culture shock is reduced because you can throw yourself into new situations with abandon. You learn the language quicker when you’re forced to get over embarrassment, in order to communicate. Travelling alone for the first time forces you to adapt to situations far quicker than if you shared the experience with someone. And you’ll bring that skill with you on future trips. No matter who you spend it with! 4. Your first trip alone teaches you a lot about yourself. You discover new things about yourself when you can’t rely on friends or family. New, wonderful qualities are revealed. Whether navigating public transport like a pro, or learning to avoid the tourist scams (touch wood!). The experience leaves us far better equipped to deal with life’s curve balls. Champs-Élysées - the street of rubies and diamonds. My first solo trip taught me that I’m actually highly capable, and to trust myself and my instincts. Most importantly, that negatives can be strengths. I used to get made to feel embarrassed at my loud, outgoing nature and talkativeness. But travelling alone for the first time taught me these things are actually a positive. It’s all about perception. 5. You discover your superpower! Captain America better watch his six-pack although I probably do that enough for him because solo travel brings out that ‘thing’ which is uniquely you. My superpower is making friends; throw me into any social situation and I’m bound to get on with someone. I once made friends with a Japanese guy on a 15-minute train ride in Tokyo! It happens. Paragliding over the Austrian Alps - my first ever bucket list item. You may discover a talent for always being able to find your way home without a map (of the Google variety or otherwise) to help you. What I know for sure is that we all have something special within, and travelling alone helps us discover it. Travelling alone for the first time thrusts us into the new and unknown, there’s no doubt about that. And the fringe benefit of solo travel to our world? Openness. Solo travel demands we be open to new places and people, and completely different ways of life. It helps fight stereotypes and break down borders, teaching not simply cultural tolerance, but cultural awareness. First time eating snails in Paris - delicious! And when we bring that openness back home with us and share it with others, and they travel, the cycle is repeated. In short, solo travel makes us better people. ... And if you happen to just stumble onto one of the wonders of the world while you’re out there being a good human and your best self... so be it! 7. It reveals exactly what you LOVE about travel. I owe my entire blog to the experience of travelling alone for the first time. It’s how I learnt what I truly love about travel; creativity and culture. It was the flamenco dancer in Barcelona, whose footwork was so rapid that it appeared she was floating. It was the graffiti gracing every spot of concrete in Berlin; a cultural symbol of the city’s rebellion against its history. And it was seeing the gracefulness of Michangelo’s David with my very own eyes. Not printed on a page, or through the pixels on a screen. The Colosseum - the largest amphitheatre of the Roman Empire. Meeting local makers and creators, gazing at fascinating architecture, absorbing the arts in all its forms; these things would become the niche of The Beat of Adventure. You discover your ‘why’ on the first trip alone, even if you’re not conscious of it in the moment. You might travel to learn about different cultures. Or the history of fallen empires. Perhaps being immersed in the fashion of Tokyo or Paris makes you feel inspired. Night views of the harbour from our hotel in Pag, Croatia. These things reveal themselves when we travel without restriction. And that’s my FAVOURITE thing about travelling alone for the first time. I’m completely bias of course, I only have a travel blog today because of it. But hey, all’s fair in love and war, and travel is a bit of both. Give me a fist bump to get hyped! If you haven’t travelled alone for the first time, go search up your first destination. I really do encourage you to try it, no matter how far or close to home you go. And if you have taken a trip alone before, pick your next destination. Most importantly though, I want you to go and experience the joys of travel in precisely the way YOU want. So get out there and explore! 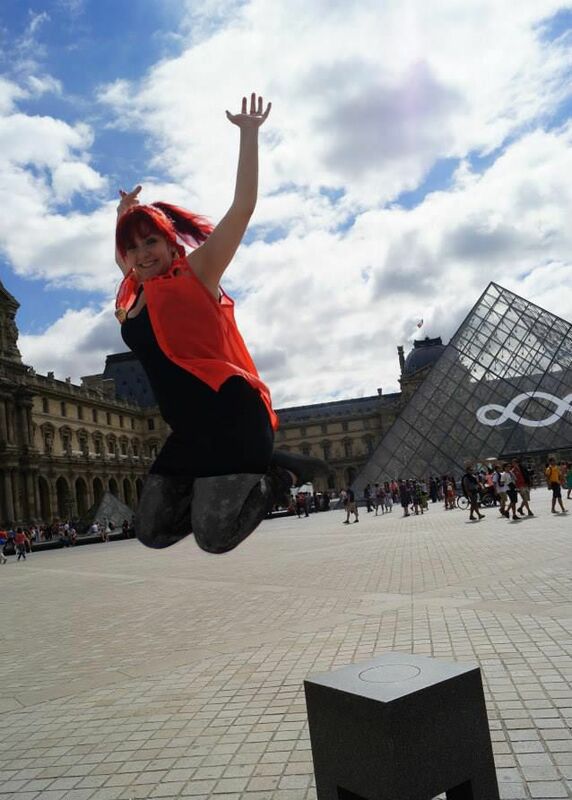 Leaping for joy in front of the Louvre, Paris! Head to Facebook or Instagram and let us know how you felt travelling alone for the first time, and what you take away from the experience. Amelia is a printer & graphic designer by day, travel blogger by night, and Harry Potter fanatic the rest of the time. A tea enthusiast and all-round creative, she started The Beat of Adventure to inspire others to ‘travel, create, inspire.’ She’s been exploring yearly since 2013, with more than thirteen countries under her belt. Chillin' in a Parisian courtyard. Vonita loves to travel. She takes a lot of pictures.